Every home and construction business needs the best multi-position ladder. Whether you are decorating your home or doing repairs for other people safety always comes first. This is where the multi-position ladders available for you to buy in 2019 here can help. The brands reviewed here offer you quality and are safe to use to protect you from accidents and injuries. They are practical to use with fantastic features. 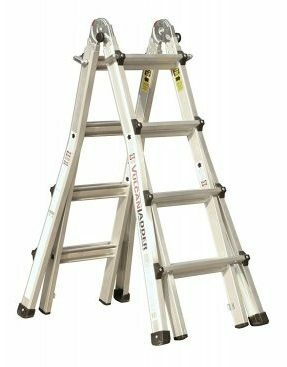 The ladders provide you different heights and available in different sizes and shapes. You can use the multi-use stepladder as a stool, straight ladder, or stair ladder. If you are fascinated in buying such a crucial item, go through our list that follows here. For a flexible ladder, choose the OxGord folding model. You can use it in seven different ways, and it has an aluminum design making it light in weight. You can use it at your construction site as a temporary bridge and automatically locks into position once unfolded. The height of the stepladder is 11.5 ft and can hold a maximum load of 300 lbs. Do you need to work on stairs or uneven spaces? You need the heavy-duty, multipurpose ladder from Idealchoiceproduct. 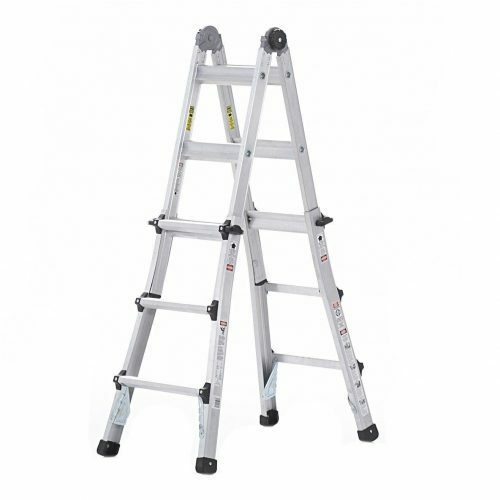 Compare to our previous product this stepladder measures 15.5 ft and has four rungs and step. Included you receive extra two platform plates. For a solid grip on any floor surface, the item has rubber pads at the bottom. You can use the equipment in five different ways. When it comes to working in your home, fixing a roof or painting, safety comes first. 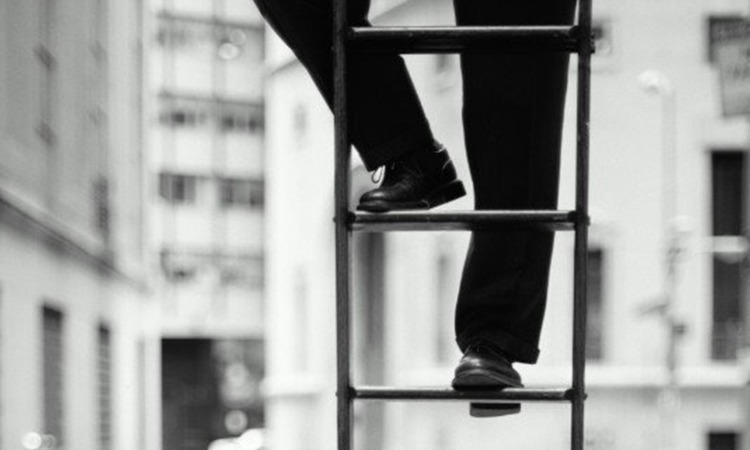 The WolfWise is a Multi-Position Ladder with a telescopic design you can use in different ways. Every section of the equipment opens and closes safely. At the bottom, there are non-slip end caps to keep the ladder secure. The structure of apparatus comprises corrosion-resistant aluminum alloy and can support a weight up to 330lbs. The product folds half its size for transporting in the boot of your car. The Lifewit is another multipurpose ladder that follows the European EN131 safety standards. The stepladders designed with multiple operating hinges and have an automatic safety lock with stabilizer bars. The bottom of the apparatus has rubber padding. To reach your roof, paint ceilings, or change a light bulb, the ladder is 12.5 feet high. The structure of the product comprises aluminum and folds up for ease of storage. 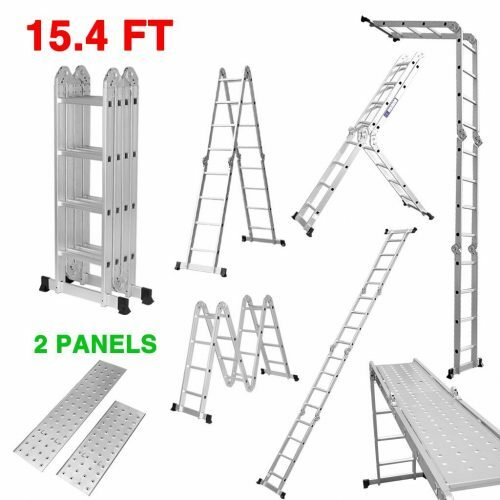 For an affordable price compared to our previously mentioned multi-use ladders here, you can buy the Vulcan that is 17 feet high. 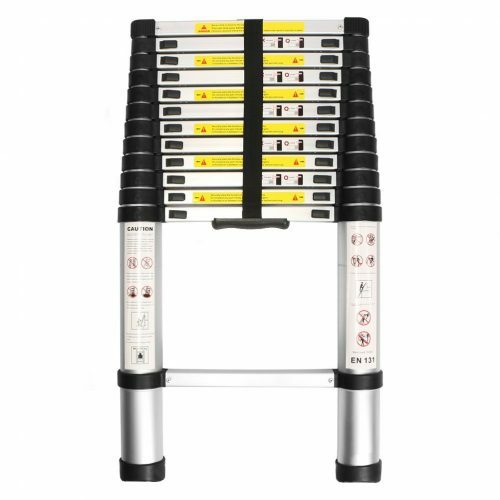 The stepladder offers you 23 possible configurations and has height adjustment in one-foot increments. With the no-pinch design, you can safely use it around the home and has a broad base for stability. With the Finether multipurpose folding ladder, you get an extended length of 15.4 ft. 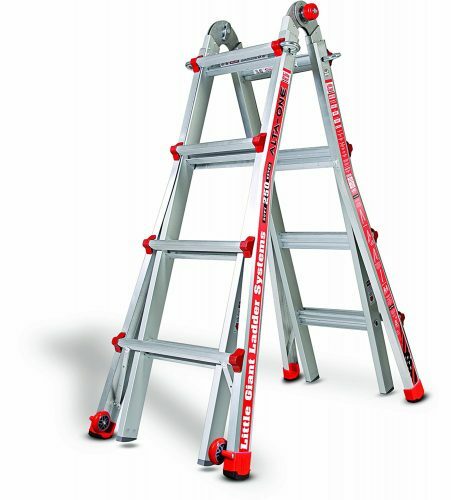 The design of the stepladder is unique with the safety locking hinges and two panels. The products certified according to the EN131 European Safety Standards. The constructions aluminum and weighs 26.9lbs and you can use it in different types of situations. 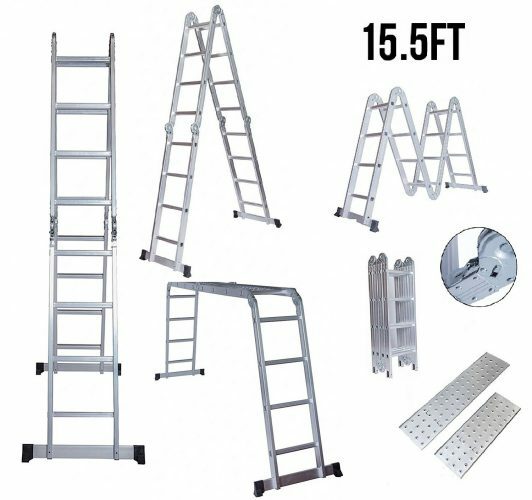 The Cosco is a five ladder in one you can use as a scaffold, stepladder, wall ladder, extension ladder and more. At the bottom of the equipment are slip-resistant rungs and feet to prevent it from slipping. To keep it secure it has a fantastic hinge design with a spring locking lever. The height of the ladder is 13 feet and holds a weight up to 300lb. 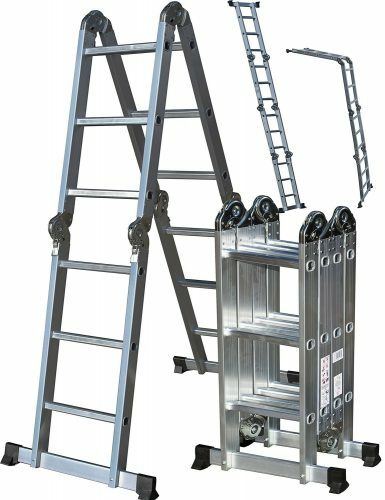 For versatility to use at home or your construction business, nothing stands in the same league as the Metaltech multi-position ladder. The telescoping ladder can hold up to 300lb and transforms from a stepladder to scaffold support. The equipment can reach a height of 14 ft and only weighs 27.6 lb. You can use it in 19 different positions. If you need a durable multi-position ladder, pick the Little Giant Alta-One. You get multiple configurations with the ladder as it has a 90-degree scaffolding system. The product complies with ANSI A14.2 & OSHA standards. Furthermore, it has a durable aluminum structure. The device can hold up to 250 lbs and has triple-locking hinges. For one of the best Multi-Position Ladders, you need the TOPRUNG model. The 26-foot stepladder exceeds the ANSI standards and holds up to 300 lbs. 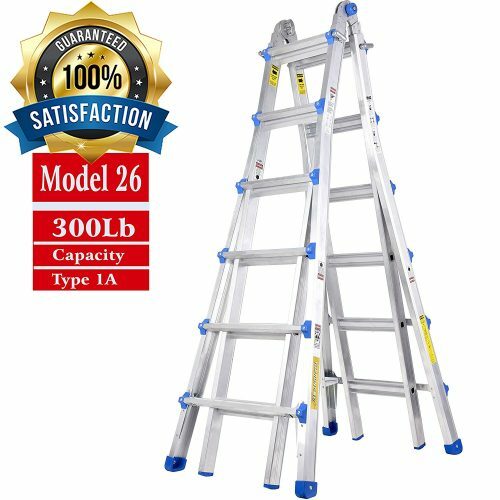 As with all our other multipurpose ladders reviewed here, this one also has an aircraft grade aluminum structure. You can use the apparatus in five different positions, and for safety, it has sturdy hinges, and you receive a three-year warranty included. 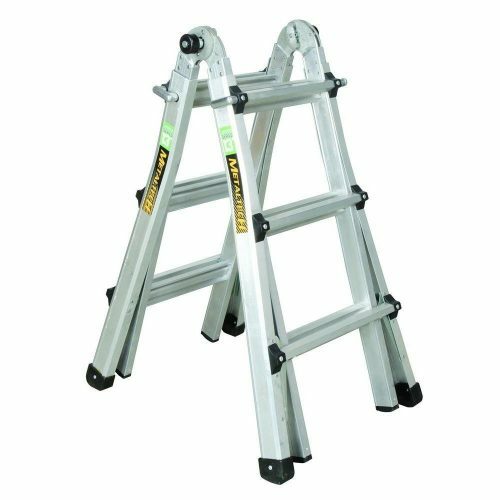 For handling small DIY tasks at home or huge ones in your construction business, you need a stable stepladder. 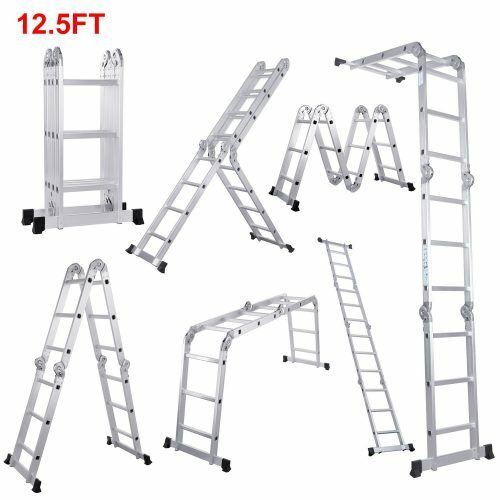 By purchasing one of the top 10 best multi position ladders, here you get more than just a ladder. You get a fine piece of equipment you can use in different positions for a variety of work tasks. Each of the brands available here offers you durability, versatility, safety, and affordable prices.